Sunbeam Plains is a grassland area found in Mario & Luigi: Paper Jam. It is west of Doop Doop Dunes, east of Peach's Castle, and south of Gloomy Woods. Mario and Luigi come to the Plains in order to rescue the Paper Toads. They fight a pair of Paper Goombas and refresh their attacks, followed by a pair of normal Goombas, who imply they have defeated Paper Mario. Later on, one of the Paper Goombas from the tutorial gathers a stack of Paper Goombas to take revenge. They almost successfully defeat the bros, but are stopped by Paper Mario. After the group of Goombas are defeated, the original Paper Goomba flees. Afterwards, Paper Mario agrees to help Mario and Luigi stop Bowser and Paper Bowser. The trio finds some more Paper Toads, and continues. 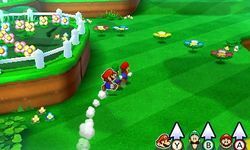 Later on, a purple Toad appears to tell Mario, Luigi and Paper Mario that Peach and Paper Peach were kidnapped by Bowser and Paper Bowser. Starlow suggests they head back to Peach's Castle to see if the Bowsers have already left, but they both arrive flying past the trio and the Toad in their Clown Cars. They taunt the team and flee to Bowser's Castle with the princesses; summoning Petey Piranha to attack Mario, Luigi and Paper Mario in order to slow them down. After they defeat Petey Piranha, they proceed to a Toad Village. They later encounter Paper Kamek, who blocks the path with a Papercraft Goomba. This inspires Toadette to build a Papercraft Mario in order to destroy the blockade, which she needs more Paper Toads to assemble. The trio return to the village to rescue more Paper Toads at the Lakitu Info Center. Afterward, Toadette creates the Papercraft, and a boss fight is engaged with the Papercraft Megacrinkle Goomba. After the Papercraft Goomba is defeated, they continue east to Doop Doop Dunes. After the group has escaped Twinsy Tropics, they return to Peach's Castle through the Plains. It has since been littered with Monty Moles and paper terrain, which is being produced from the summit of Mount Brrr. After stopping by Peach's Castle; the trio head to Gloomy Woods. When traversing through the Plains again, they are blocked by Paper Petey Piranha, who is chasing a Green Toad. After successfully defeating Paper Petey Piranha, the trio continue to Gloomy Woods. When the trio and the princesses are blown off Neo Bowser Castle to Sunbeam Plains, they go through the Plain one last time to go back to Gloomy Woods to Mount Brrr, to get to Neo Bowser Castle. The clouds above the Plains are explored here. This page was last edited on May 17, 2018, at 21:11.